President Cyril Ramaphosa has confirmed that his son, Andile Ramaphosa, received payments from corruption accused facilities management company Bosasa, but that he had questioned his son, and was satisfied that it was an above board transaction. 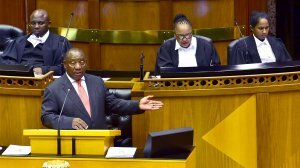 Ramaphosa was responding to questions in the National Assembly on Tuesday. Democratic Alliance leader Mmusi Maimane asked Ramaphosa to set the record straight on the payment from Bosasa, which he says he discovered in a sworn affidavit by Peet Venter. Venter is an auditor whose company was contracted by Bosasa. Last year, Bosasa changed its name to African Global Operations. The affidavit, which News24 has seen, was commissioned in December 2017. Ramaphosa said he had become aware of the issue some time ago, and had questioned his son on the matter. Venter's affidavit details that he was instructed by Bosasa/AGO CEO Gavin Watson to make a payment of R500 000 into an attorney’s trust account in October last year. This trust account was linked to Andile Ramaphosa, Venter claims. "My son has a financial consultancy business, and he consults for a number of companies. One of those companies is Bosasa. I asked him at close range whether this money was obtained illegally or unlawfully," Ramaphosa said. According to the president, his son produced a contract between himself and Bosasa. "He is running a clean business… if it turns out their was any irregularity or corruption I will be the first, I assure you Mr Maimane, I will be the first to make sure he becomes accountable. I will take him to the police station myself," Ramaphosa said. The question session continued on Tuesday.